This window is rich with wonderful church imagery. The lilies held by the Angel Gabriel are a symbol of purity. And Mary’s long and flowing hair is symbolic of a virgin. There was no way for me to know when I accepted an invitation several years ago to a Religion in Art tour at The Nelson-Atkins Museum of Art in Kansas City, Missouri, that the tour would ultimately result in my tacit obsession with the stained-glass windows at Holy Name Church located in Kansas City, Kansas. I am a Holy Name parishioner, so my unquestioned presence blesses me with the time to admire and reflect on this liturgical art. 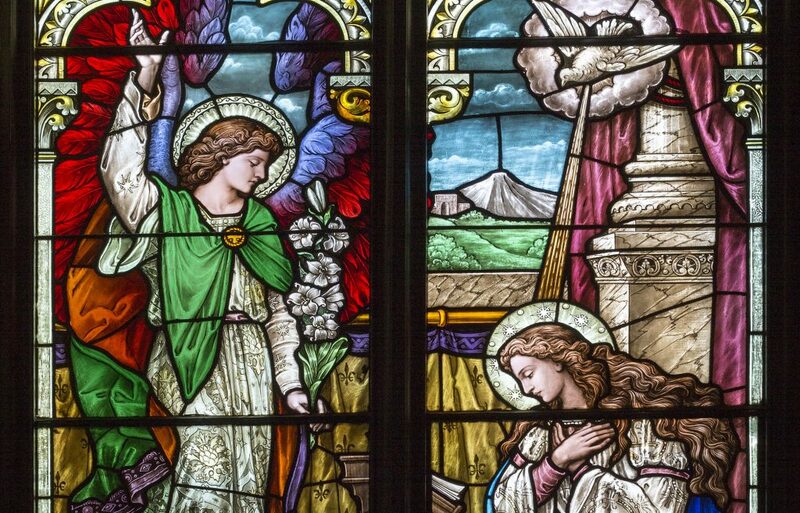 The stained glass at Holy Name was created by the artisans of the Munich Studio (Chicago) around 1903, which means this stained glass is some of its first commissioned works. So much has been written about the Munich Studio that additional research is readily available online. Instead of attempting to repeat knowledge about the studio, I would like to share the impact and validity their work continues to have on new and continuing viewers — on me — over 100 years after their original installation. Holy Name’s cornerstone is dated 1909, and it is home to over 25 individual works of Munich Studio stained glass. Twelve of the primary stained-glass windows line both sides of the church nave, each majestic window measuring approximately 16 feet tall by 4 feet wide. The powerful size of these windows allows for almost life-size portrayals of the scenes, which have been taken from the pages of the Bible in the New Testament. Seven of the 12 scenes represent the mysteries of the rosary. As taken from Catholic Online, the windows represent all four of the rosary mysteries (joyful, sorrowful, glorious and luminous). Stained-glass scenes include: the nativity of Our Lord Jesus Christ, finding Jesus in the Temple at age 12, the agony of Jesus in the Garden of Gethsemane, the resurrection of Jesus Christ and the wedding at Cana. I would like to focus on the annunciation of the Lord to Mary and the visitation of Mary to Elizabeth. When the Angel Gabriel tells Mary she is to be the mother of God, the Holy Spirit descends upon Mary. At first glance, through the skilled eyes of a docent at the art museum, we are immediately drawn to the symbolism used by the medieval and Renaissance art masters. For instance, the image of Mary on this stained-glass canvas is a woman with uncovered, very long and flowing hair, the symbol of a virgin. Then, we notice the lily flowers, the symbol of purity, in Gabriel’s outstretched hand. And to the side of Gabriel and under his feet are beautiful red roses, so beautiful you can almost smell them. I have no firsthand experience to date, but some folks believe there is a smell of roses in the air when angels are present. In addition to the symbols mentioned above in the community of the art masters, the more Christian-than-art-wide symbol is the dove — the Holy Spirit — descending on Mary. Is the geography out the artist’s window in Mary’s room a clue to more symbols? It is my understanding that at the time of the annunciation, historians believe Mary was in Nazareth, and there are several mountains located nearby in that region. In the New Testament, the geography might lead us to a Mount Precipice reveal (see Lk 4:29), since that is the site where Jesus would be threatened of being thrown off “the brow of the hill.” And the threat to Jesus comes after he is speaking at a synagogue and we also see a structure by the mountain out Mary’s window that could be a rendering of a synagogue of the time. When Mary went to visit her relative Elizabeth, typically the scene is of the two women: Mary, a virgin with child, and Elizabeth, an older relative who was surprisingly also with child. Mary’s child will be Jesus Christ, and Elizabeth’s child will be John the Baptist. Of course, the halos we see above the persons are a symbol of holiness or sainthood. Next, note the rarity of a rendering of that visitation with the two women plus their spouses, Joseph and Zechariah. The depiction cannot help but touch one’s heart; in today’s society, we are moved to recognize the importance of fathers in family life. Very few artists show the men as actors in this scene. But these two men were a great support to these significant mothers. And are not all mothers significant? And fathers, too, are essential in the lives of each child — so much so, that they should not be left out, especially not left out visually as a symbol for our society and us today. I also find this work reassuring for more mundane reasons: I see the lifelike weeds growing out between the pavers and here is a way to identify with these historical figures who often tower over us in our regard for them. Then and now in our rushed lives, the time we spend with our children and family remains a priority over a few weeds. Holy Name’s website is: www.holynameparishkck.org. Mass is held at least once daily except Mondays, when two or more gather to say a rosary for peace. The only slightly technical thing I think I know about stained glass is that it is intended to have light behind it for all of its beauty to radiate. And as those rays of sunlight pass through the stained glass, just as it has for over a hundred years, I obsess. There continues to be something new to notice each time I look, sometimes even very current in our lives today that we can associate with as we admire. Is it divine? We are entitled to our own opinions, but for me, I am full of hope. Patti Comstock is a fourth-generation Holy Name parishioner. The first was her paternal great-grandmother who came to America (Kansas City) as an indentured servant. She is retired and enjoys volunteer opportunities at Holy Name that serve and support the parish and local community, such as the community food kitchen. Adapted with permission from the Stained Glass Quarterly magazine, Winter 2017, a publication of the Stained Glass Association of America.